Cliff Cornell in currently jailed at Camp Lejeune, North Carolina. Cliff traveled to Canada in 2005 to resist Iraq deployment. “I don’t want to be killing innocent people,” he explained at the time. He was deported from Canada in February 2009 and was convicted of desertion at Ft. Steward, Georgia in May. More information about Cliff. Tony Anderson is currently jailed at Fort Sill, Oklahoma. Tony was sentenced to 14 months in the stockade for resisting Iraq deployment. “I know in my heart that it is wrong to willfully hurt or kill another human being. I simply cannot do it. I don’t regret following my conscience,” he said at his trial. More information about Tony. Travis is currently jailed near Fort Hood TX awaiting transfer to Fort Lewis WA. Note that Travis is still in need of donations to cover his defense costs. Please see info below. Leo Church is currently jailed at Fort Lewis WA. He is not a exactly a "war resister", but is deserving of support. Dustin Stevens is not currently in jail, but on restriction at Fort Bragg NC. The correspondence limitations described below do not yet apply. He has been charged with desertion and is facing possible court martial. We recently helped expose the outrageous treatment of dozens of soldiers at Fort Bragg, NC with “Echo Platoon - Warehousing soldiers in the homeland” by Courage to Resist's Sarah Lazare and Dahr Jamail, Tom Dispatch. August 10, 2009. Now the most outspoken of the "Ft. Bragg 50" needs our support! Know that your correspondence will be read and reviewed by the military; however, general political content is not usually a basis for censorship. Do not send stamps, photos, magazines, newspapers, etc. Photocopied articles and photocopied photos, when accompanied by a personal letter, are usually OK.
You may send a money order (payable to the jailed resister). This money will be deposited into their “safe keeping” fund administered by the stockade. From this fund, they may purchase postage stamps (to write you back) and phone cards (to call family and friends). You may send a book; however, you must order books from amazon.com (or bn.com) and have them shipped directly to the resister. Consider asking the jailed resister if they have any specific title requests, or general categories of interest (mystery, political history, sci-fi, etc.) prior to ordering. Courage to Resist has hosted many individual resister defense funds since 2006, including Army objectors Agustin Aguayo, Cliff Cornell, Robin Long, Ryan Jackson, Tony Anderson, and Victor Agosto. These funds have ensured that those courageous soldiers had civilian legal counsel and support while in jail. 20 supporters have given $1,785 of the needed $3,000 as of September 3, 2009. 47 supporters have given $1,391 of the projected $3,000 needed as of September 4, 2009. Supporters are encouraged to donate to Dustin's defense while signing the online petition below. Petitions are an important way for the community to express support for GI resistance, and to positively impact the outcome of a given situation. "To Commanding General - Free Army conscientious objector Dustin Stevens and end the illegal pre-trial punishment of Dustin Stevens and the Fort Bragg 50! ...These soldiers are subjected to many months of unjust and illegal punishment prior to their day in court. We respectfully request that the Army improve living conditions, reassign sadistic supervisors, end all informal punishments, and expedite resolution for these soldiers..."
"To Stephen Harper, Prime Minister of Canada - I am writing from the U.S. to ask that you abide by the House of Commons resolution to create a program to allow war objectors, including U.S. resisters, to apply for permanent resident status in Canada and to cease all deportation and removal proceedings against them..."
Germany: Grant André Shepherd asylum. A campaign initiated by Connection e.V., a Germany-based peace organization. "To the German Government - AWOL U.S. soldier André Shepherd applied for asylum in Germany. His tour of duty as a U.S. soldier in Iraq made him convinced that he could no longer participate in a war which breaks international law... we appeal to you, grant André Shepherd asylum..."
"To: Lieutenant General Rick Lynch, Commanding General - We urge that Travis Bishop be released immediately and unconditionally..."
Organize a letter-writing party in your community to show support for war resisters. Robin Long, recently deported from Canada, is serving a 15-month sentence for refusing to fight in Iraq. Tony Anderson is currently serving a 14-month sentencing for resisting deployment to Iraq. Many more war resisters are sitting in prison for refusing to fight in Iraq and Afghanistan, and countless more live with that possibility. Several war resisters have been threatened with deportation from Canada, and Chris Teske and Cliff Cornell have already been forced to leave. War Resister Letter-Writing Parties provide a concrete way to show emotional support for war resisters and establish human connections between civilian support networks and troops refusing to fight. The idea is for a group of people to bring their community together to write letters and to use the occasion to build awareness and solidarity around the issue of G.I. resistance. 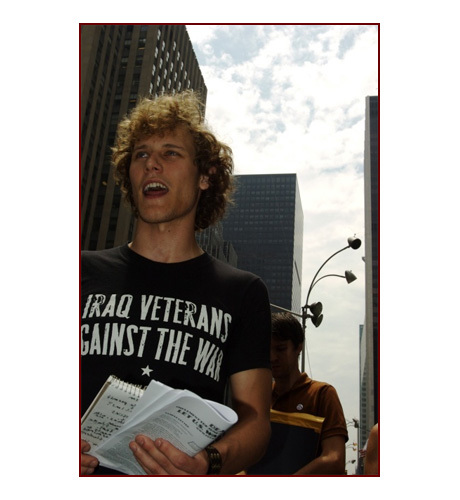 We are asking folks to organize their letter-writing events around the sixth anniversary of the Iraq War so that we can take this somber occasion to recognize the brave troops who refuse to fight: the people who give us hope that an end to unjust war is possible. Courage to Resist will provide you with all of the materials and information you need to host your letter-writing party, including: information and contact info of war resisters, template letters for U.S. and Canadian governments, and literature about G.I. resistance. If you are interested in organizing a letter-writing party, or if you have any questions, please contact us at courage@riseup.net or 510-488-3559. We are happy to walk you through the process of organizing a letter-writing party and brainstorm ways to tailor your event to the needs of your community. Iraq War resister currently pending court-martial at Fort Stewart, Georgia after returning from Canada. U.S. war resister Cliff Cornell surrendered himself to U.S. border police on February 4 after being ordered to leave Canada. He was promptly arrested for being AWOL from the U.S. Army, and taken to the Whatcom County Jail in Bellingham, Washington. During a vigil by local supporters the next day (photo below), Cliff was released! Upon release he was ordered to travel on his own to Fort Stewart, Georgia. This morning Cliff and his civilian lawyer James Branum planned on surrendering to the AWOL Apprehension Unit at Fort Stewart. The 28 year-old from Mountain Home, Arkansas refused to go to war because "it just didn't feel right," he told supporters at a 2005 rally in Canada soon after arriving. "I don't want to be killing innocent people." Cliff explains that he joined the Army only after repeated promises from the military recruiter that he could serve his country without being deployed to Iraq. Of course, that turned out to be lie. Cliff traveled to Canada four years ago after his Army artillery unit was ordered to Iraq. Despite a popular outcry in Canada to provide sanctuary to U.S. soldiers who refuse to fight in illegal wars, Canada’s Conservative government is pressing ahead with deportations. Cliff had come to call British Columbia home. But he now faces an expected court martial at Fort Stewart, and possibly two years in an Army stockade. Cliff is the third Iraq War resister to be forced out of Canada. Chris Taske also returned to United States a couple of weeks ago, but was not arrested at the border. Chris and his lawyer are making plans to surrender to the military soon. Last July, Robin Long became the first war resister to be deported from Canada since the Vietnam War. Robin is now serving a 15-month prison sentence at Miramar Naval Consolidated Brig near San Diego. We will forward these letters as soon as possible, and we'll post a direct mailing address for Cliff when one becomes available. A defense fund for Cliff Cornell has been established by Courage to Resist, a war resister support group. SANCTUARY DENIED (CANADA) - Army deserters fight deportation. This article, by Tiffany Crawford, was published by Canwest News Service, January 6, 2009. OTTAWA - An American war resister, who was told he must leave Canada Tuesday or face deportation to the United States, will not have to vacate the country until at least the end of January, says a support group. Michelle Robidoux, a spokeswoman for the War Resisters Support Campaign, said Dean Walcott's case has been held over until Jan. 30. Other U.S. resisters facing possible deportation include Cliff Cornell, Corey Glass, Jeremy Hinzman, Patrick Hart, Matt Lowell and Kimberly Rivera - and their families. Some of the resisters have applied to the Federal Court to have their cases overturned on humanitarian and compassionate grounds. ``If the Federal Court agrees to a judicial review of these resister's cases, that could be very positive,'' said Robidoux. The Federal Court previously agreed to hear two of the cases, said Lee Zaslofsky, co-ordinator of the support group. Glass has been granted a new application to stay on humanitarian grounds while Hinzman and his family will go before the court Feb. 10. ``I'm hoping the Federal Court will be positive in Jermemy Hinzman's case and if not set a precedent, then at least give guidance on other cases that are pending, as well,'' said Zaslofsky. Rivera, who was the first woman to refuse to serve after being deployed to Iraq, will face a decision on her deportation order Wednesday. Rivera gave birth Nov. 23, said Robidoux, and will go before the board on compassionate and humanitarian grounds. ``So if she is deported and jailed, she will be separated from her newborn and she has two other young children,'' said Robidoux. Cornell, who was ordered to leave Canada by Dec. 24, or face deportation, also had his case held over until Jan. 22. Cornell, 28, is originally from Arkansas but lives on Gabriola Island, near Nanaimo, B.C. He has been in Canada since January 2005 after refusing deployment to the Iraq war. Another American, Christopher Teske, also living in B.C., will have a decision heard Jan. 20. Lowell is waiting to hear whether his appeal will be heard. This calendar of events was copied from the We move to Canada blog. This is a partial calendar, because how much much happens is up to you: people of peace all over Canada will make this week a success by becoming involved. Please pledge to do one thing, every day, to support war resisters in Canada. A phone call to your MP. A letter to a local newspaper. An hour of leafletting outside a local event (Obama's inauguration might provide you with one). An email to all your contacts. One action, every day. The court dates in February and March may bring good news for our cause, so it's no coincidence that the Harper Government is trying to rush war resisters out of the country before then. If deported to the US, the war resisters face court martial, prison time and dishonourable discharges, the equivalent of a felony offence. 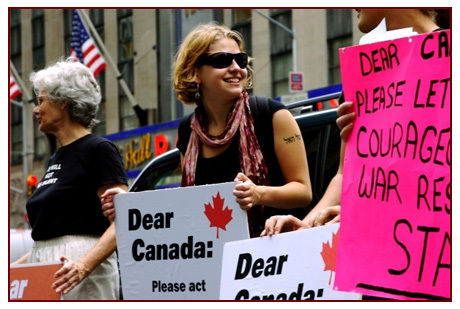 On June 3, 2008, Parliament passed a motion calling on the Government to cease all deportation proceedings against war resisters and allow them to stay in Canada. The Harper Government continues to flout democracy by ignoring the motion. In response to this crisis, we are launching "Let Them Stay Week", January 19-26, a national week of actions to show the broad Canadian support to let war resisters stay. As we mobilize support across Canada, I hope you will consider what you can do to help. Monday, January 19: Write a letter to the editor of your newspaper of choice. When papers get enough letters on one topic, they're likely - even obligated - to print one or more. 2. Tuesday, January 20: Leaflet a local event. See the War Resisters Support Campaign site for a leaflet, make your own, or email me. The Obama Inauguration may provide you with a local event. If not, stand in front of a subway or commuter rail stop at rush hour. 3. Wednesday, January 21: In Toronto, we'll hold a press conference featuring war resister families and many prominent Canadians, including supportive MPs. That evening, there'll be an event in Toronto's Parkdale neighbourhood, home to the Rivera family, Dean Walcott, Dale Landry, Ryan Johnson and other resisters live. This is a neighbourhood event organized by the community itself - mothers from Kim's day-care, people she knows through the local health centre, her son's school - working Canadians, many of whom are also immigrants. I'll post details as I have them. If you want to plan a small solidarity event in your community, this might be the night to do it. Thursday, January 22, will be a national call-in day focusing on Immigration Minister Jason Kenney & Prime Minister Stephen Harper. Friday, January 23 will be a day to call or drop by your local MP's office to ask what they are doing to support resisters. The War Resisters Support Campaign encourages people of peace throughout Canada to use the framework of "Let them Stay Week" to be creative and organize local events in support of war resisters. Any group you belong to - faith, peace, labour, LGBT, environment - can get involved. Please send this information to your membership and invite them to act. Supporting resistance to war is a concrete way of supporting peace. And giving refuge to military resisters speaks to the kind of society we want Canada to be. We are also collecting signatures of prominent Canadians for an open letter to Immigration Minister Jason Kenney. If you have any leads in this regard, please get in touch with me. 60 people gathered outside the Canadian consulate on Avenue of the Americas July 9 to call for the Conservative Party-led government of Canada to honor the House of Commons measure that calls for asylum and residency for United States war resisters living there. At the end of the protest, petitions were delivered to the Canadian consulate expressing support and solidarity with war resisters in Canada, as well as calling on the Canadian government to follow the will of their citizens by halting deportation proceedings against members of the U.S. military who have taken a stand against the Iraq War. As the Indypendent reported in a June 26, 2008 article titled “G.I. Resisters Face Legal Limbo in Canada,” the non-binding measure in support of war resisters was passed on June 3, 2008. It followed a December 6, 2007 recommendation from the Canadian Standing Committee on Citizenship and Immigration to implement a program to allow war resisters in Canada to legally stay there. 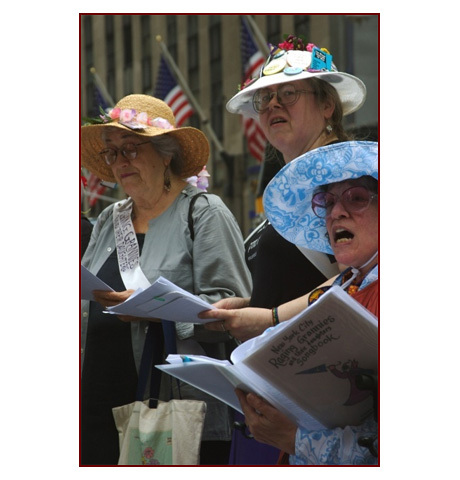 The protest, with members of the War Resisters League, Code Pink, the Granny Peace Brigade, United for Peace and Justice, and more, followed a call from Courage to Resist to organize vigils outside Canadian consulates across the United States. 14 other cities in the U.S. heeded their call, from Dallas to Los Angeles to Philadelphia and more. The War Resisters League spearheaded the New York City demonstration. There was little police presence, with only one NYPD officer visible on a bicycle. Corey Glass, a former sergeant in the National Guard of California, was scheduled to be deported July 10. That day, he was granted a stay of removal from the Federal Court of Canada, allowing him to reside in Canada for at least another two months. Matthis Chiroux, a member of Iraq Veterans Against the War and a Brooklyn College student who refused to deploy to Iraq two and a half weeks ago, had a message of solidarity for Corey Glass. “Corey Glass is a hero of the human cause,” Chrioux said. “The Canadian government should embrace him as such…Corey, though I have never met you, know you are my hero and a true hero for this country.” Chiroux is awaiting arrest, imprisonment and trial for his courageous stand against the Iraq War. “It doesn’t sound like [Harper] wants to [follow the House of Commons measure], but who knows? We need to exert pressure right now, and show that the Canadian population doesn’t want [resisters to be deported], the U.S. population doesn’t want this…It’s time to end the U.S. occupation of Iraq, and support these courageous soldiers who are putting international law in their conscience,” said Matt Smucker, an organizer with the War Resisters League.